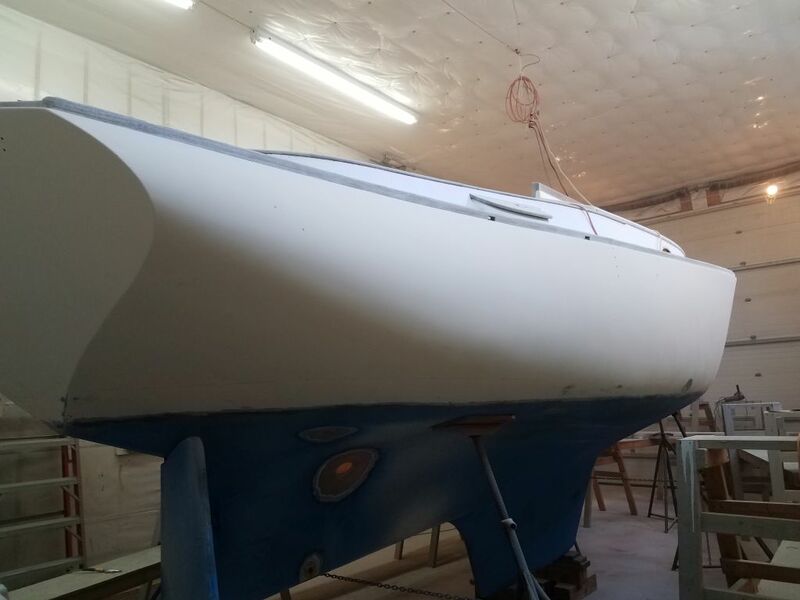 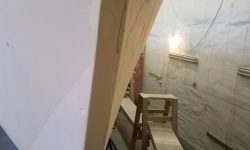 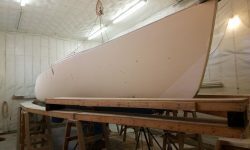 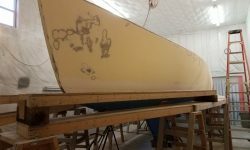 To continue sanding the hull, I set up staging to allow me to reach all the way to the gunwale. 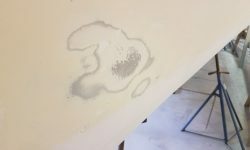 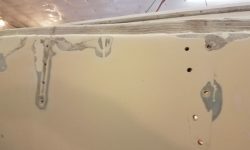 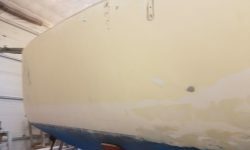 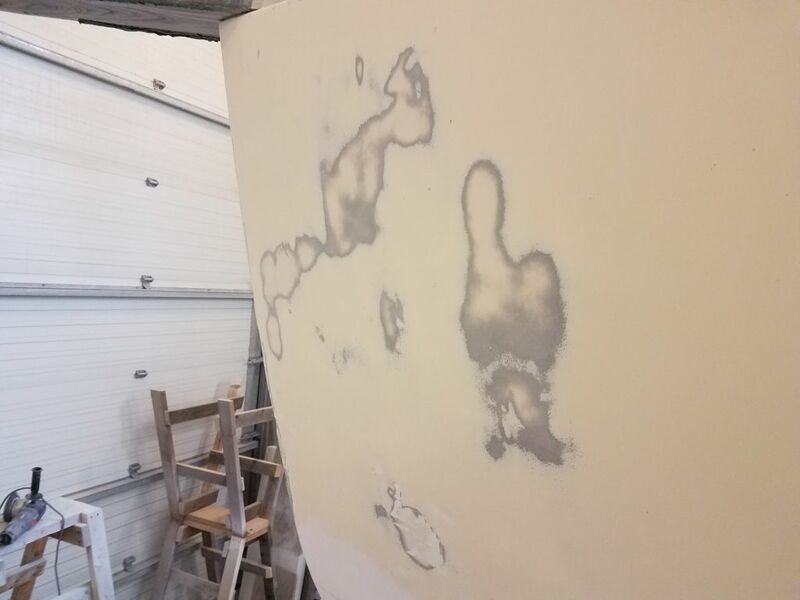 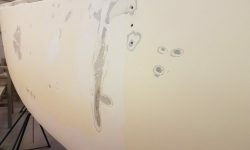 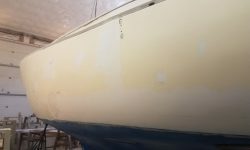 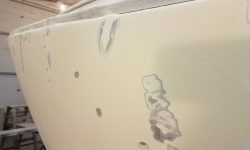 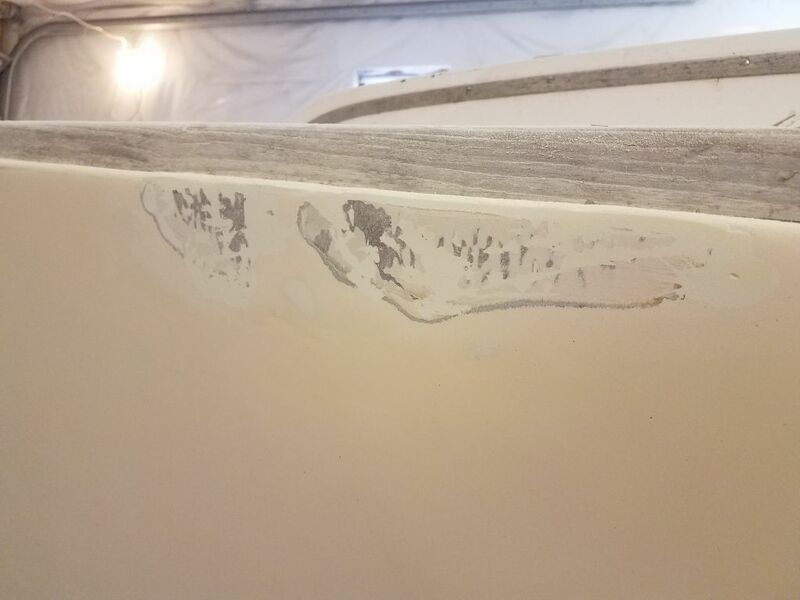 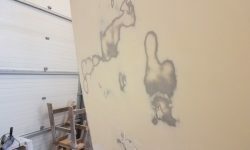 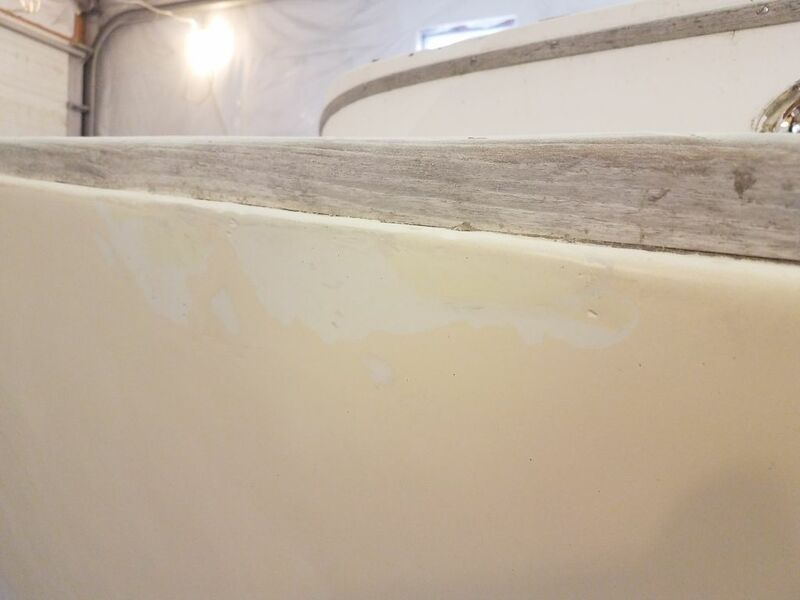 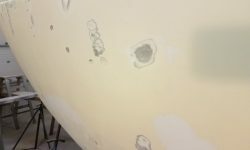 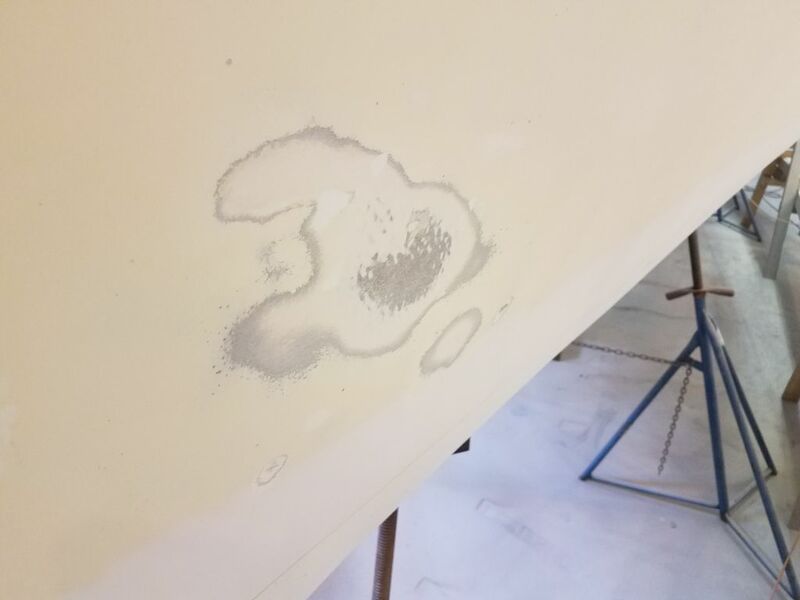 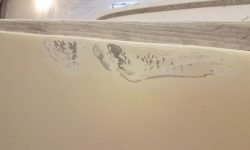 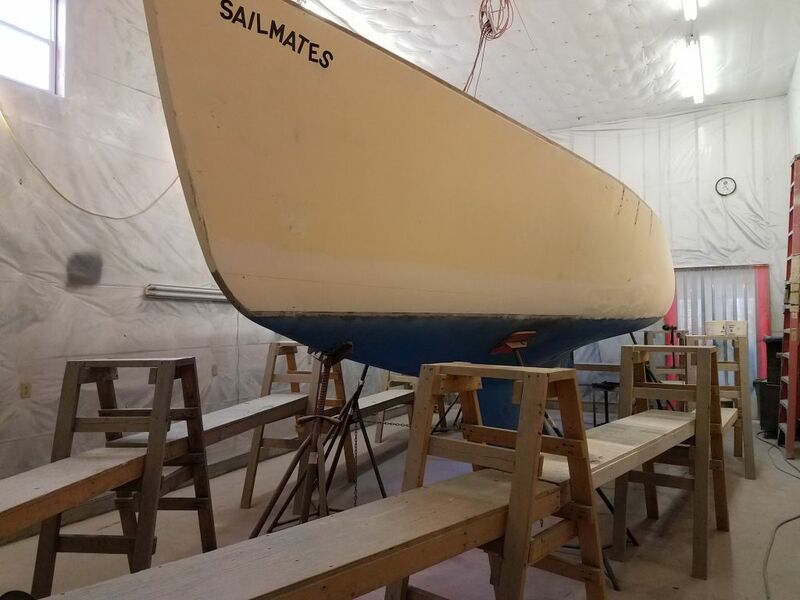 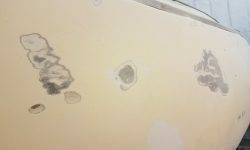 I worked my way along both sides of the boat, sanding the existing surface with 80 and 120 grits on my 6″ finishing sander to scuff and prepare the substrate for additional work as needed. 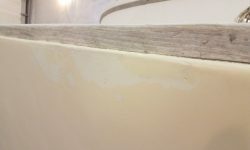 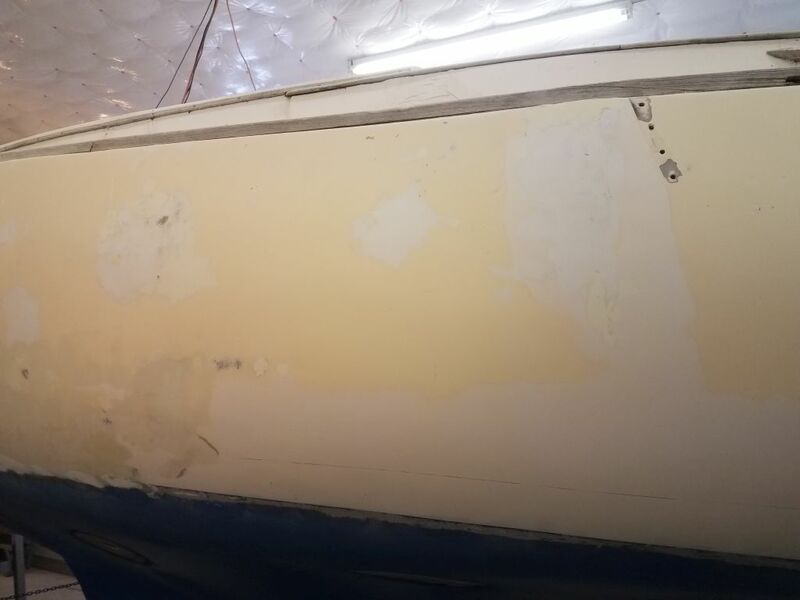 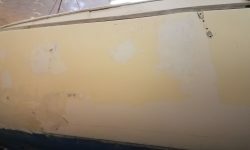 The starboard side was in much better condition than the port side, but in both cases the basic sanding was straightforward. 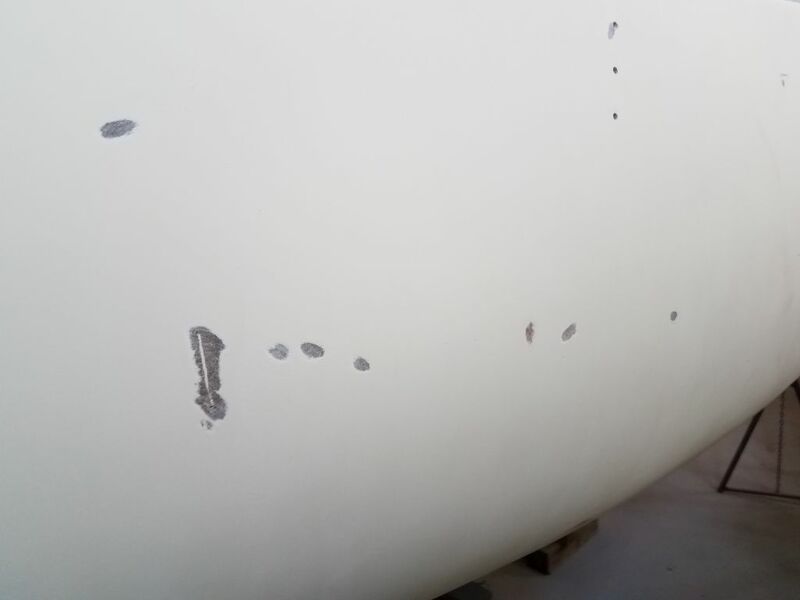 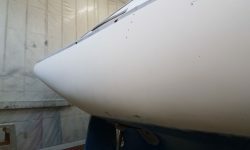 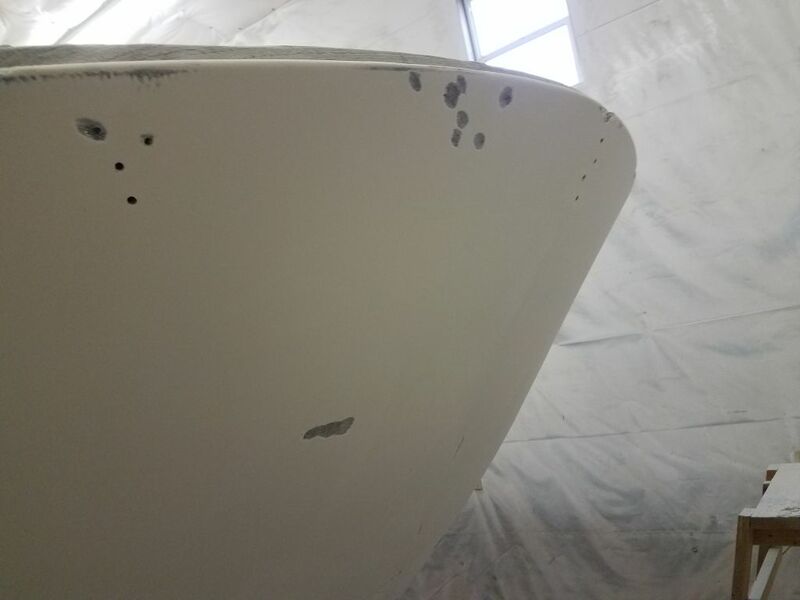 On the port side, I sanded the various repairs to begin to smooth them, but it was clear most of the messy work would need additional attention to remove suspect fairing compound, thickened gelcoat, and what have you. 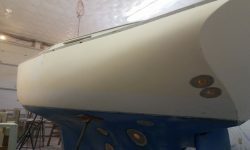 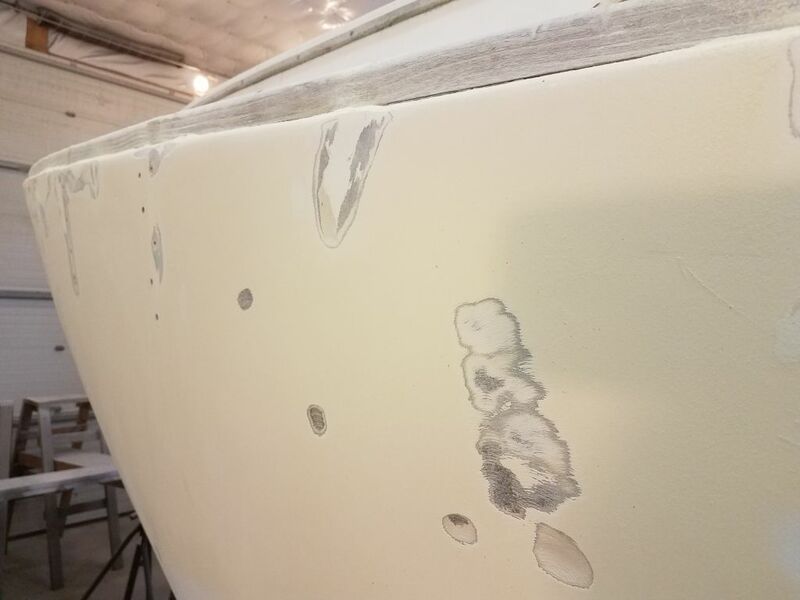 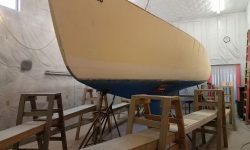 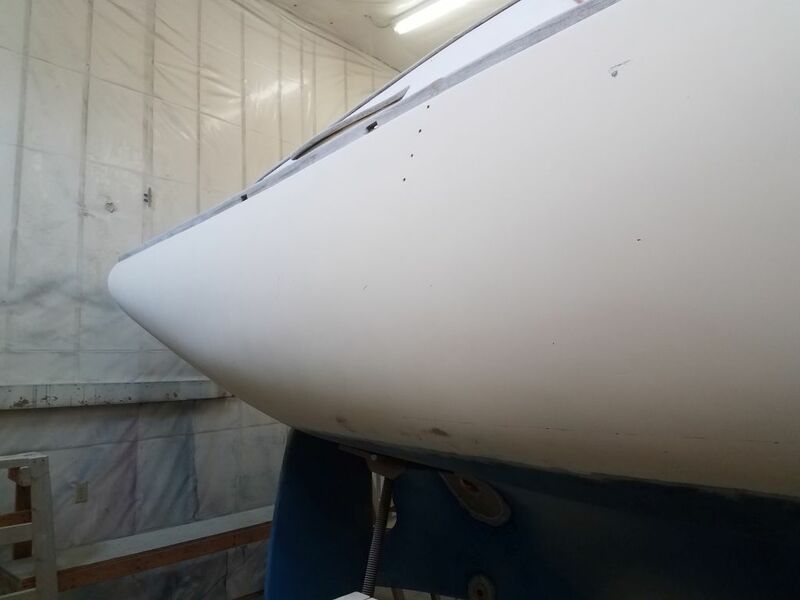 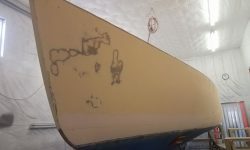 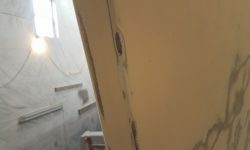 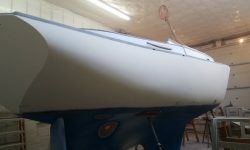 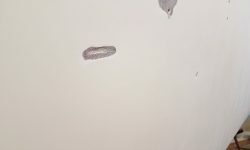 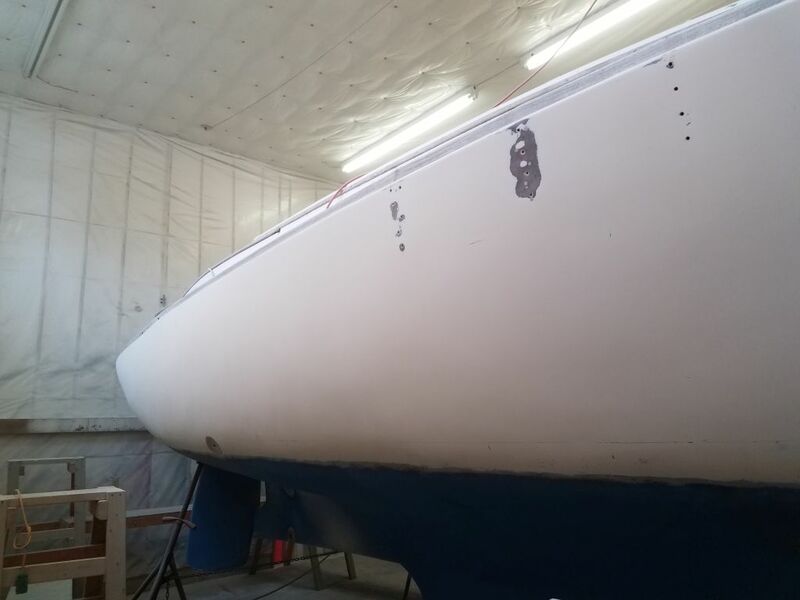 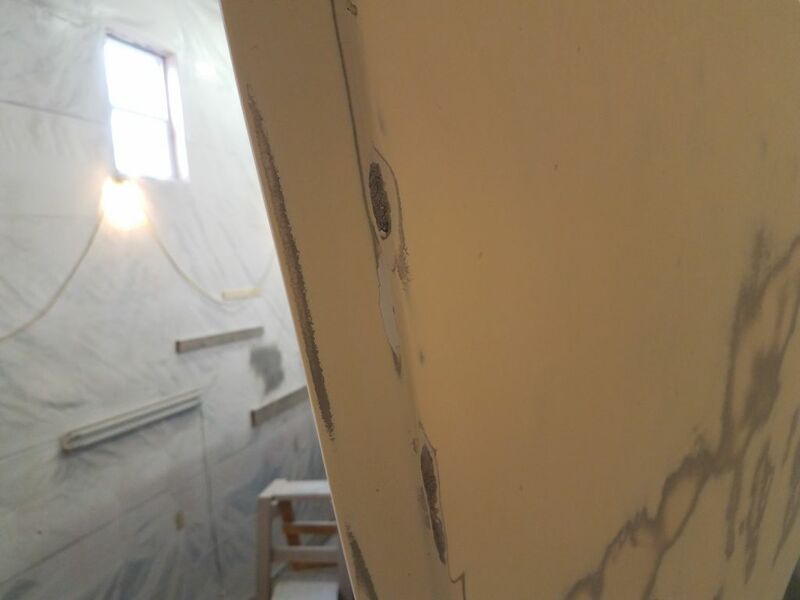 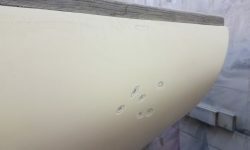 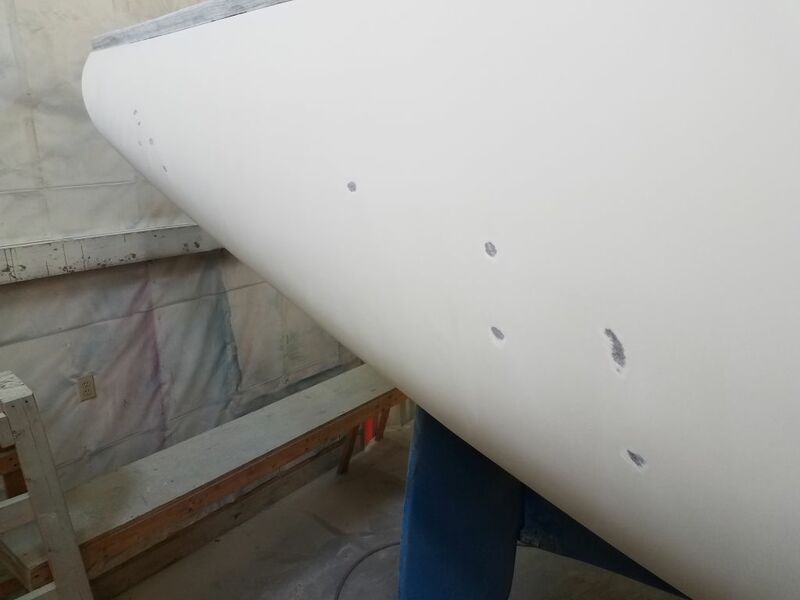 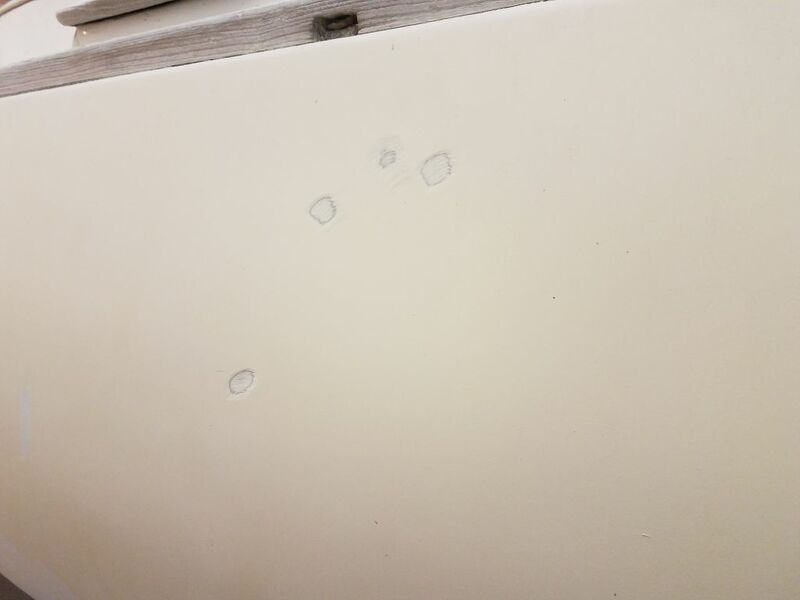 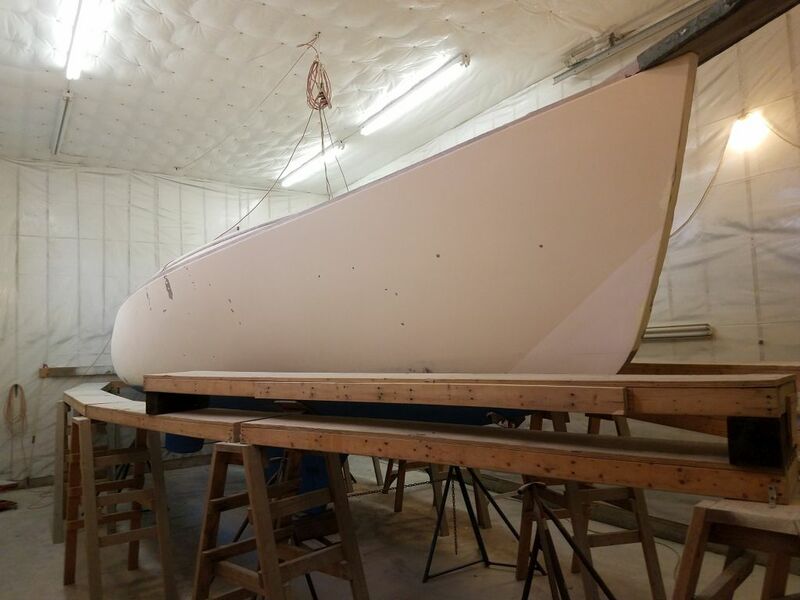 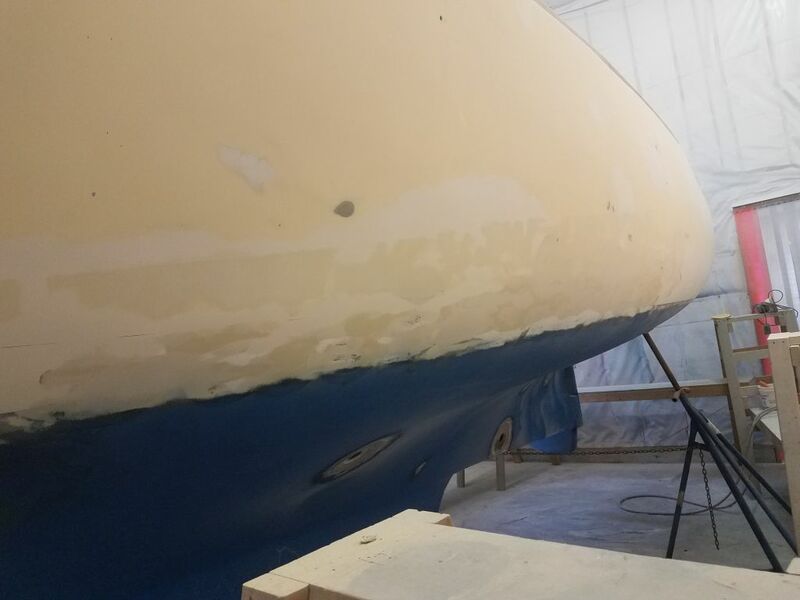 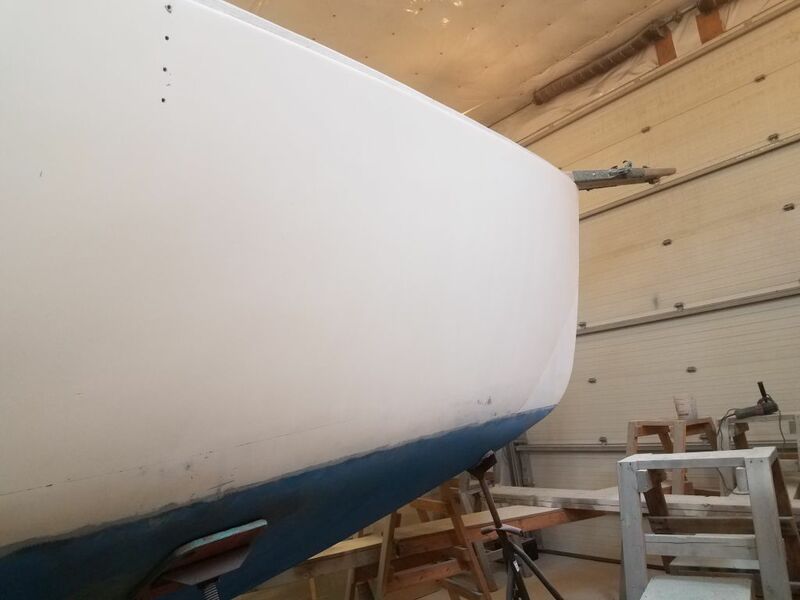 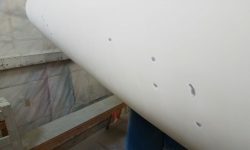 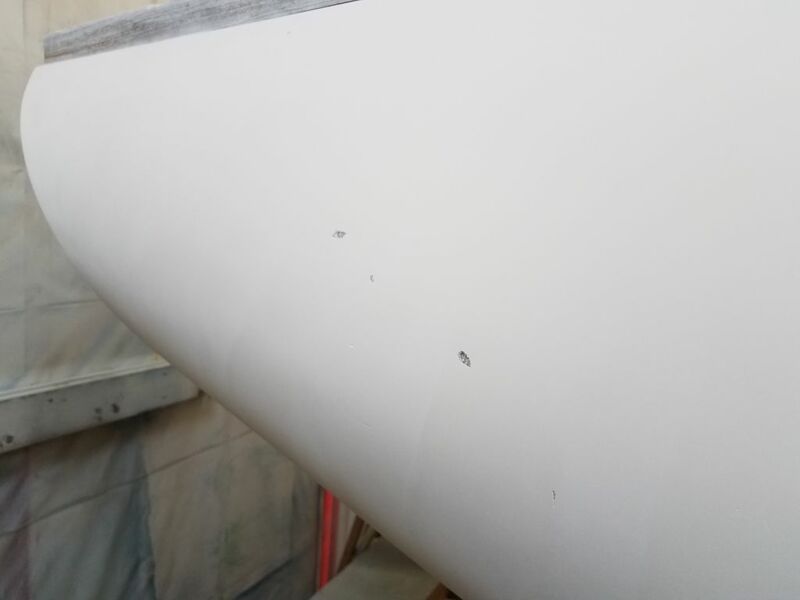 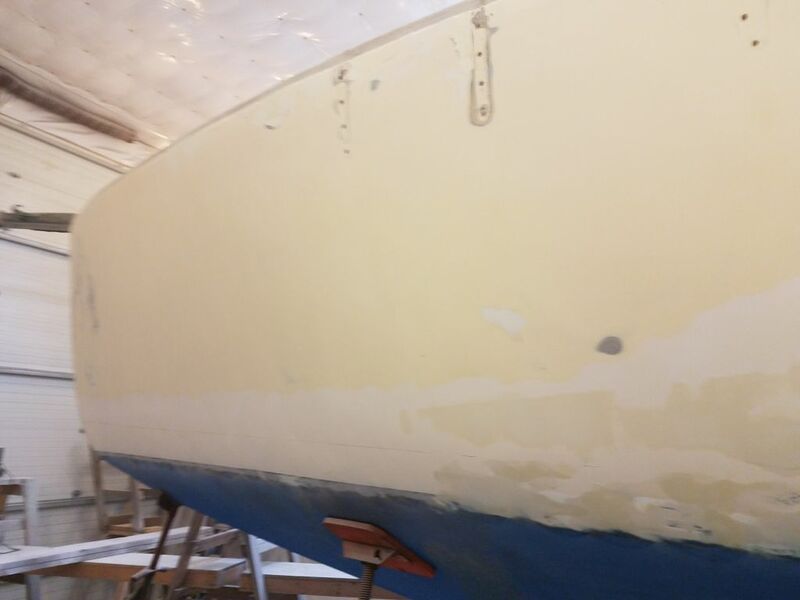 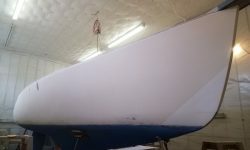 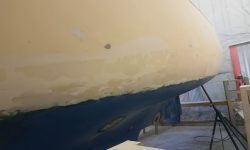 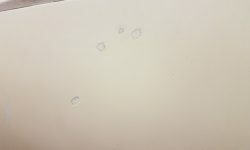 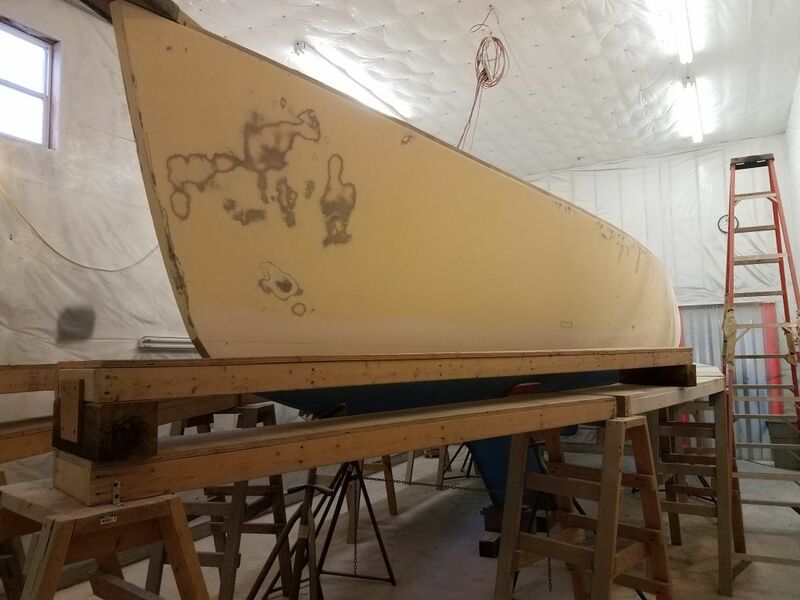 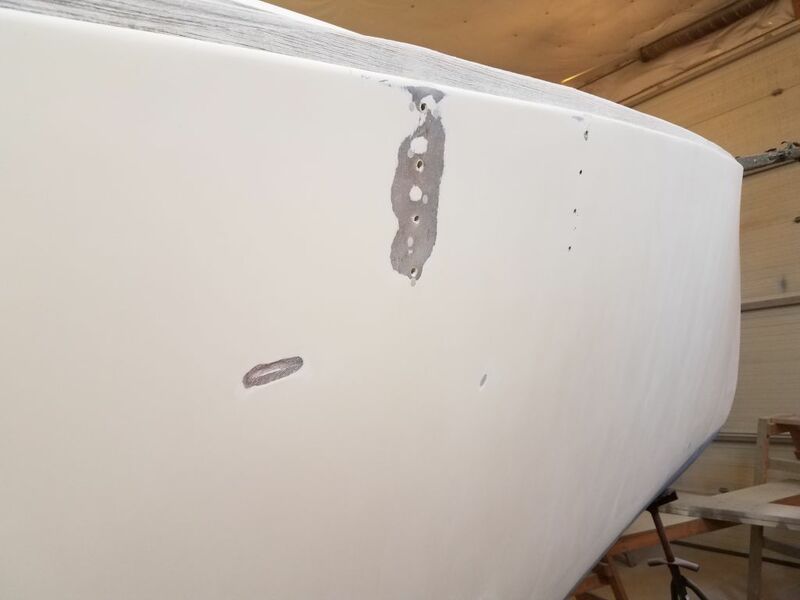 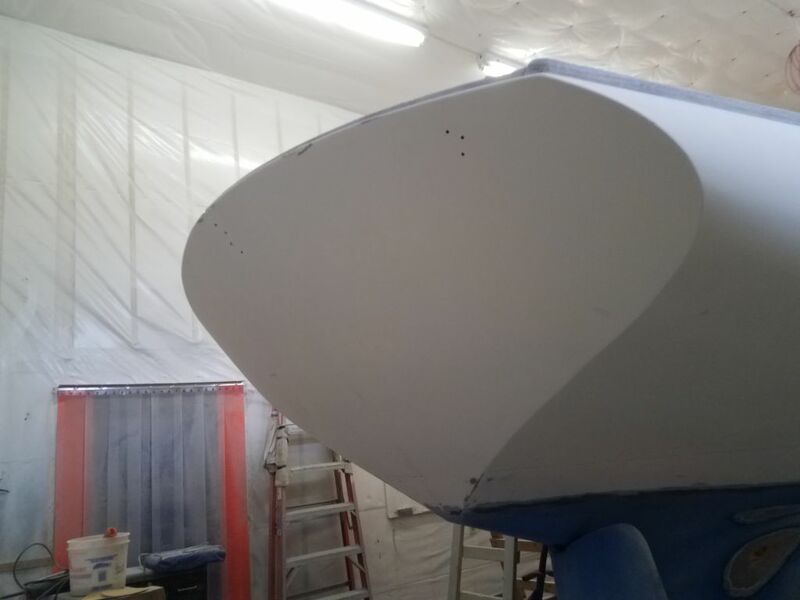 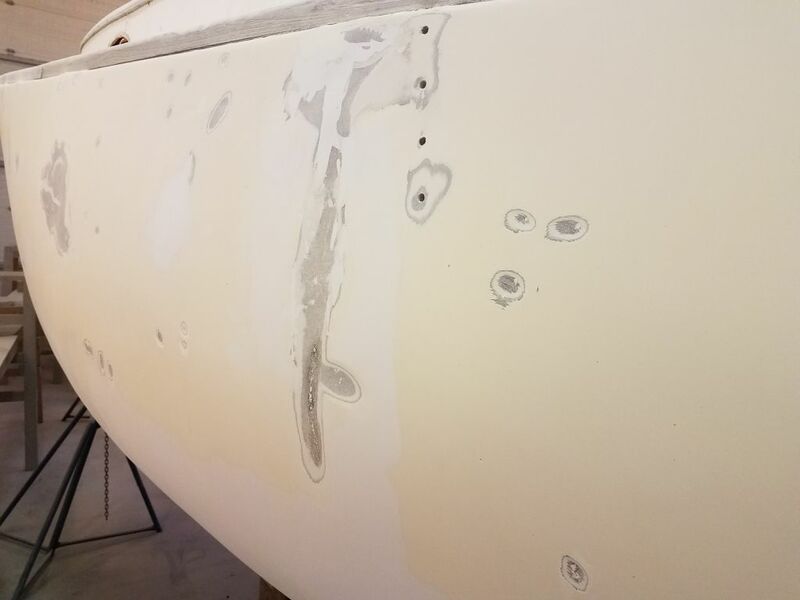 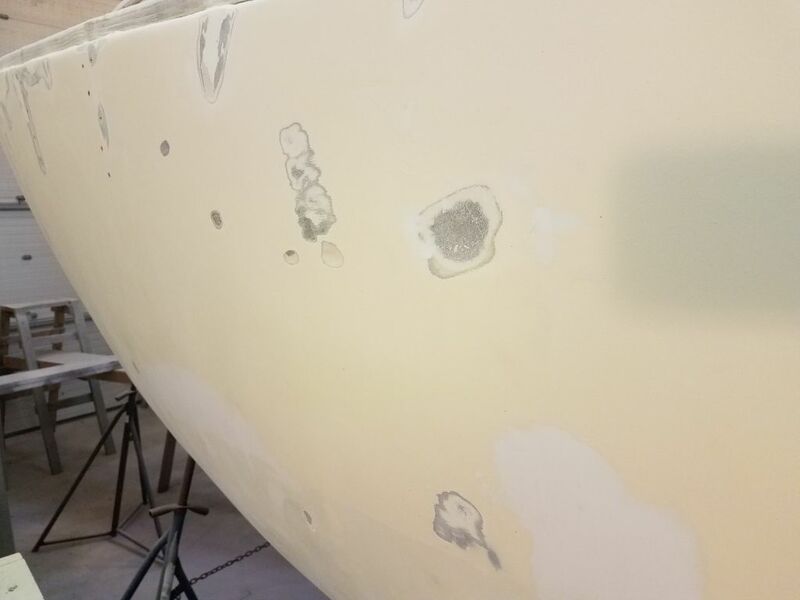 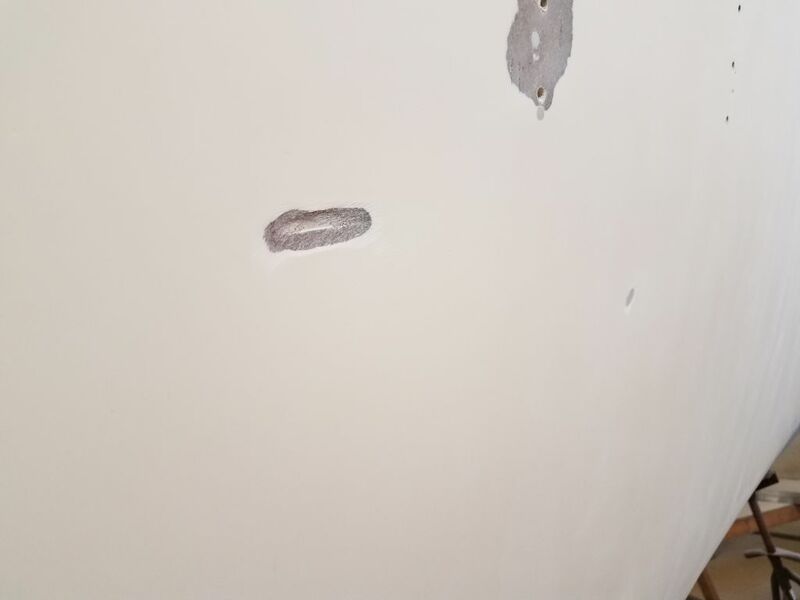 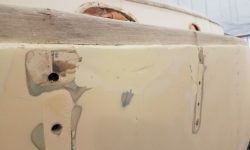 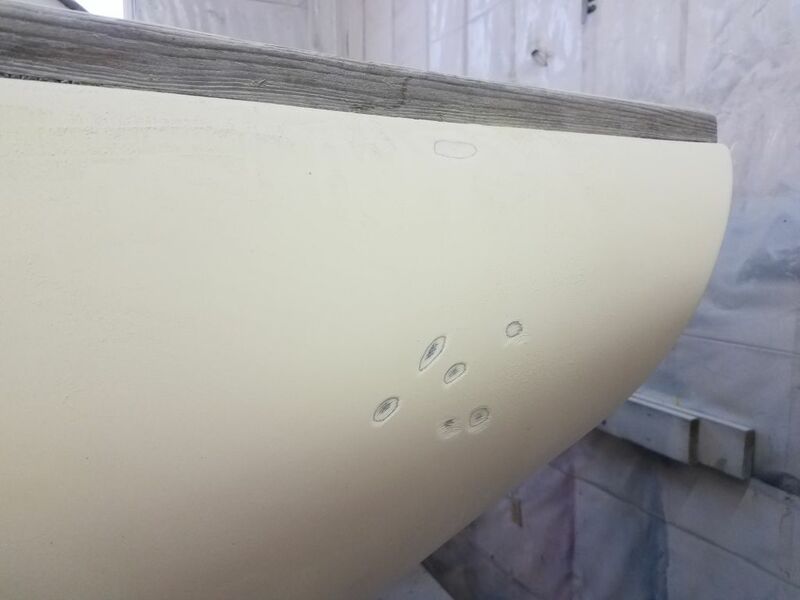 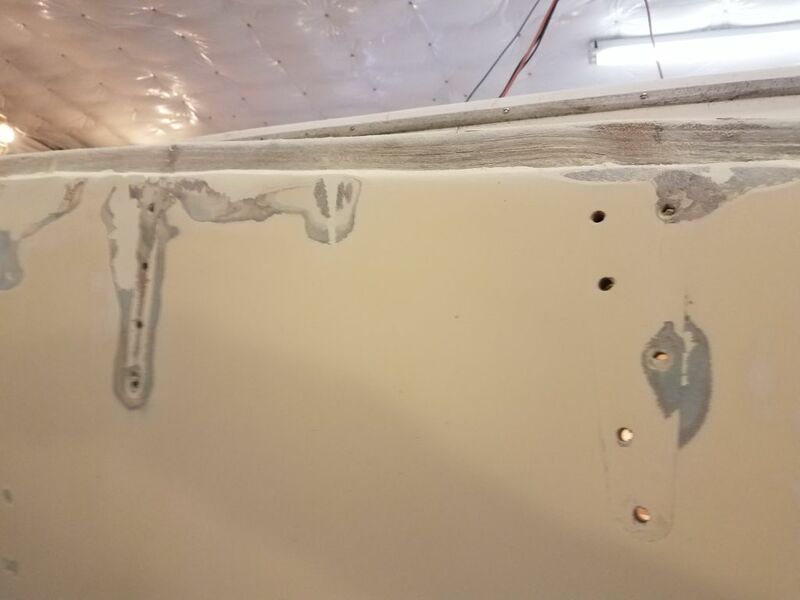 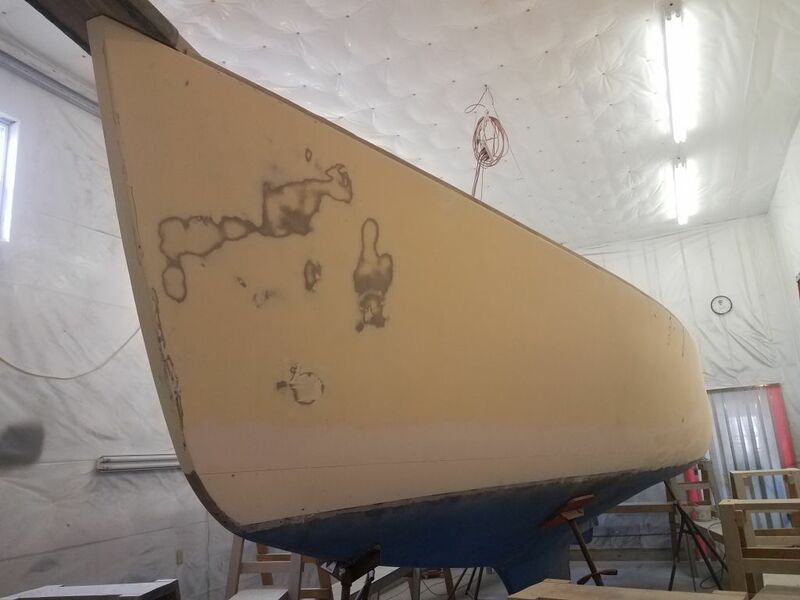 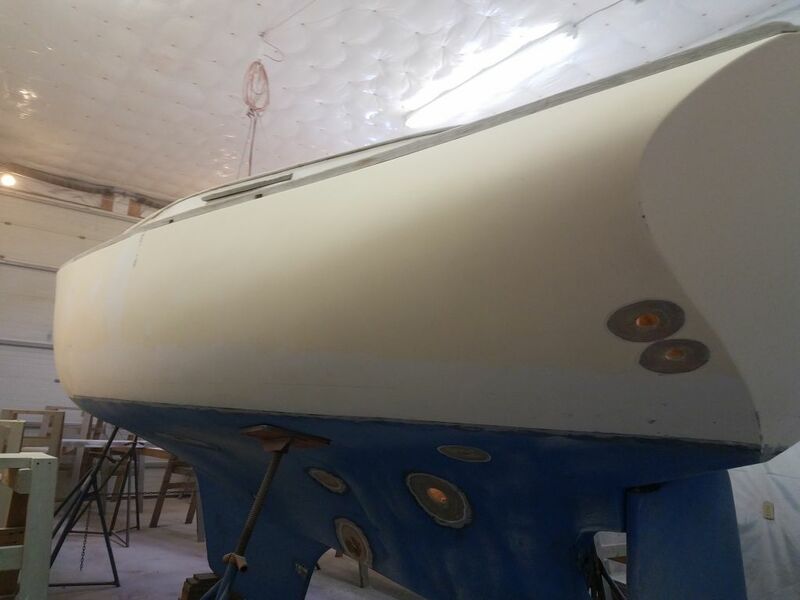 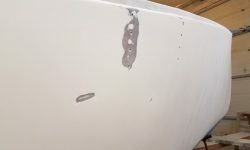 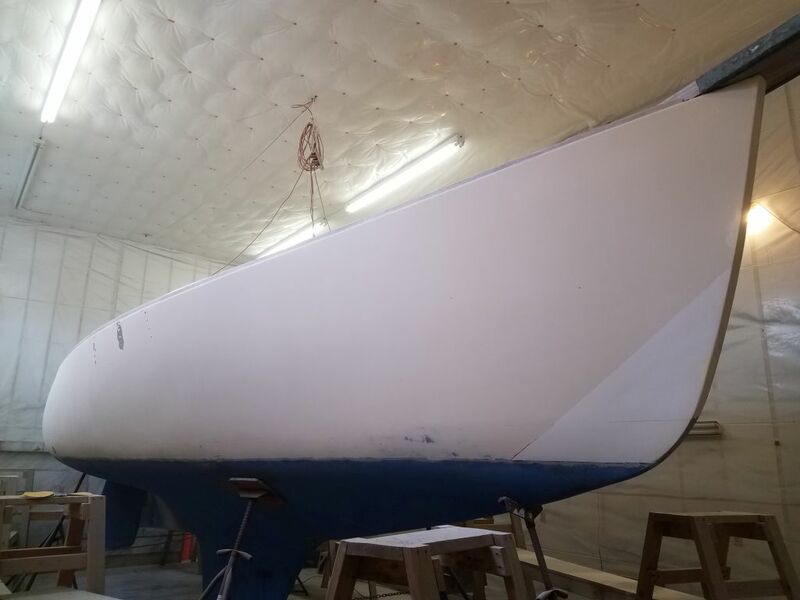 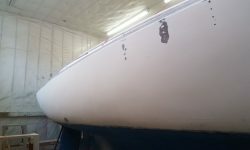 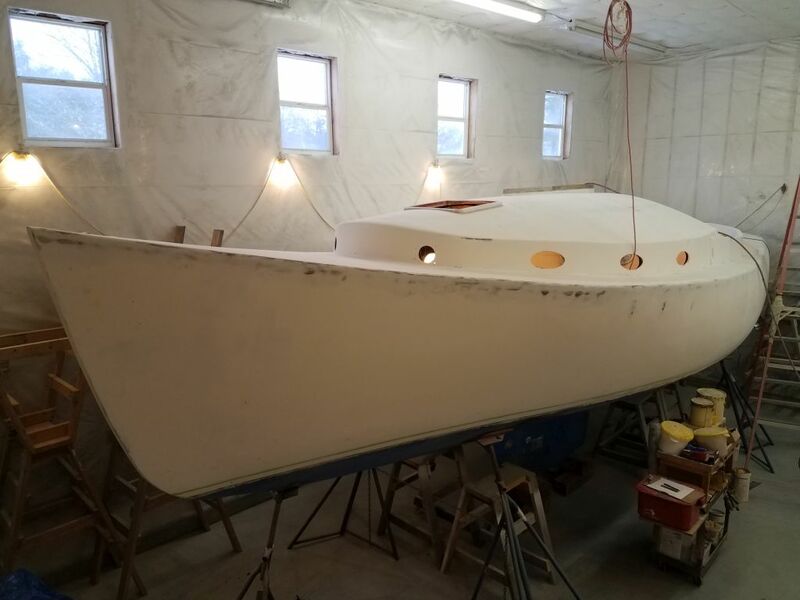 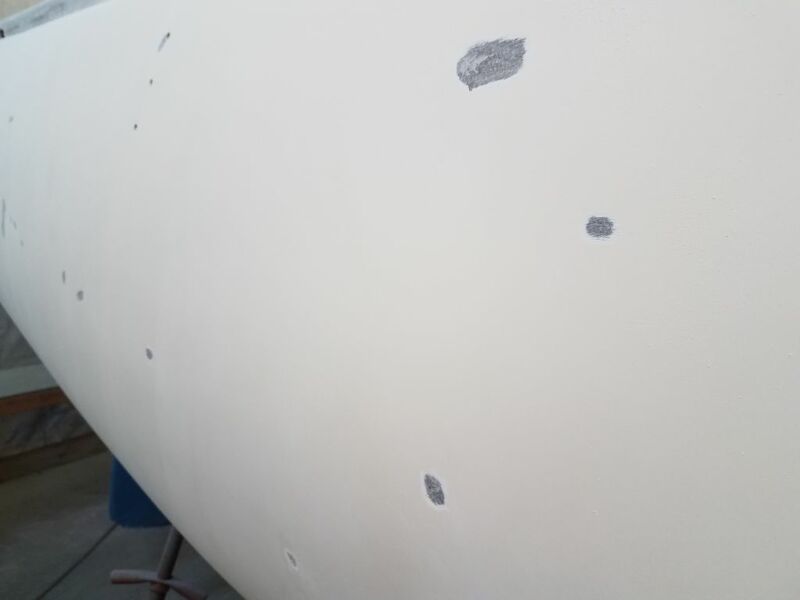 With the initial sanding rounds complete, I went around the boat closely with a small sanding disc to gouge out small dings, gouges, gelcoat pinholes, and so forth. 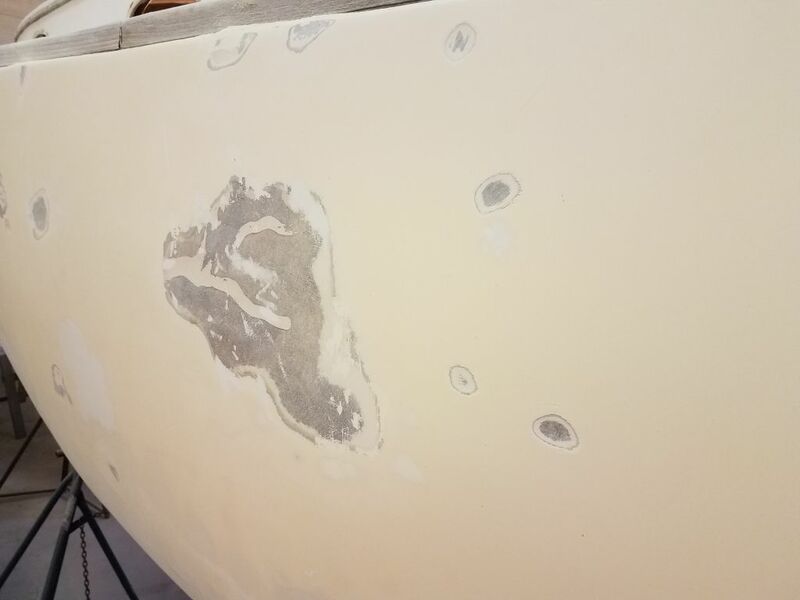 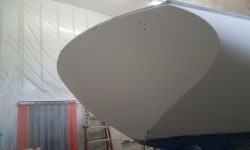 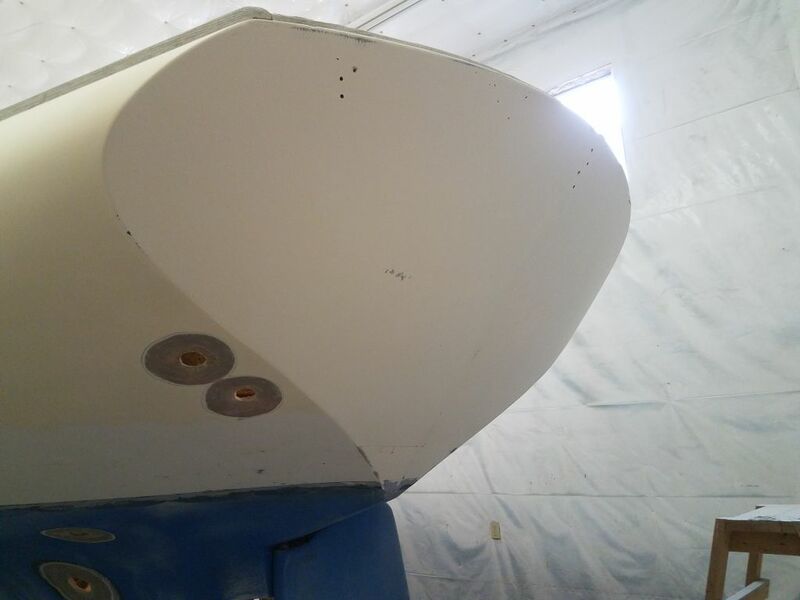 The starboard side had the usual collection of these areas, and I used the small grinder to broaden the areas and provide a wider area to accept fairing compound later. 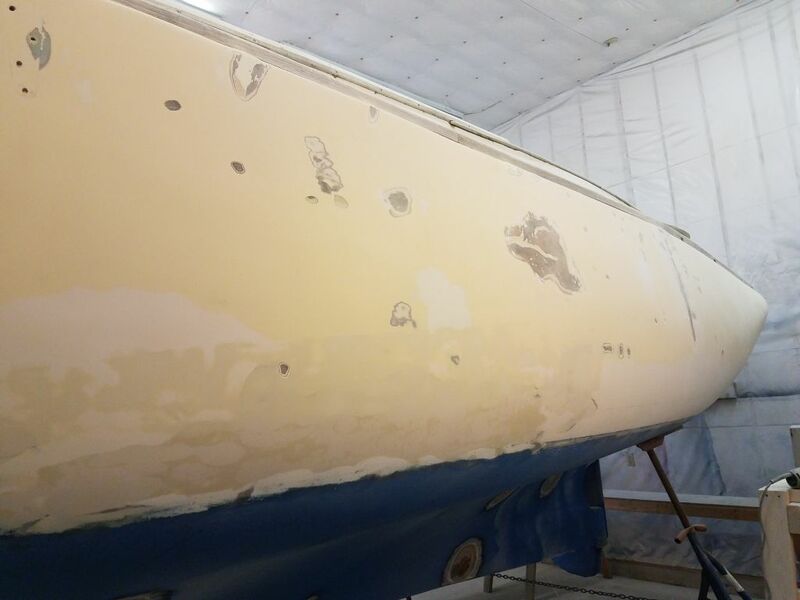 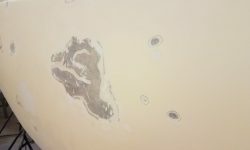 On the port side, I did the same thing, but here I also concentrated on all those visible repairs, many of which I felt needed to be ground down so I could refair the areas more appropriately. 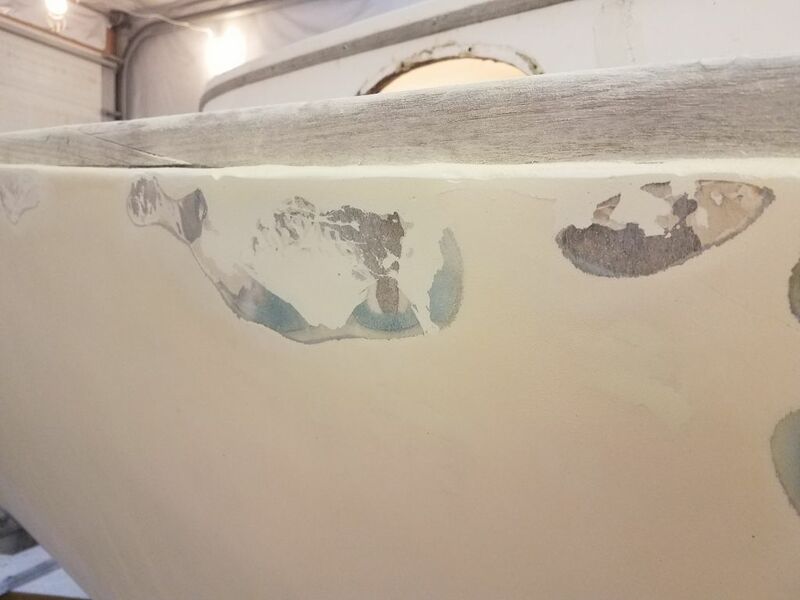 It seemed that the port side had been painted before too (not the starboard, though), and there was some minor paint adhesion failure at the port bow that I sanded away. 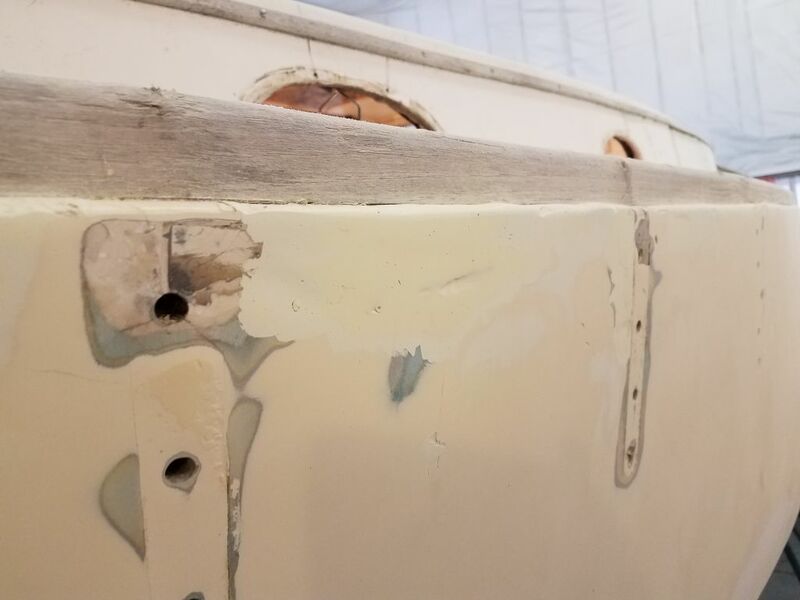 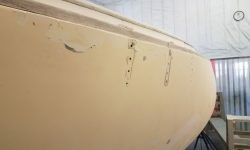 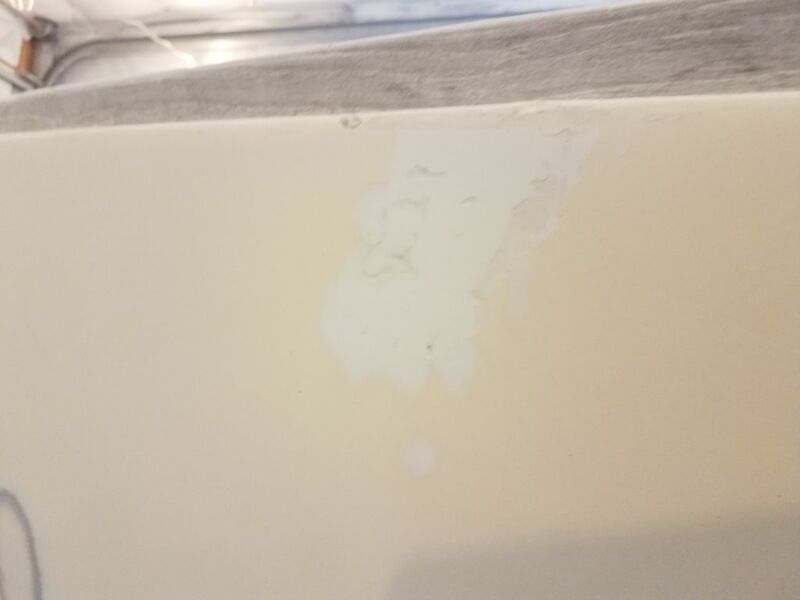 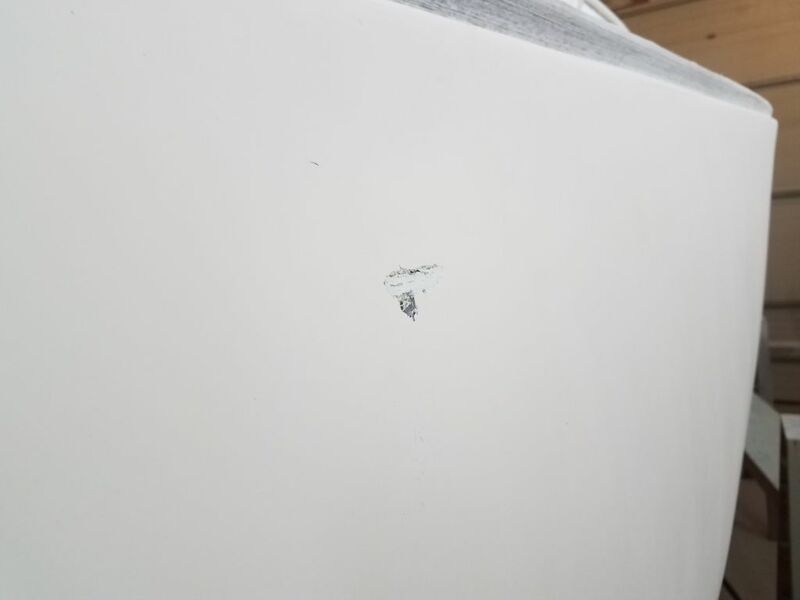 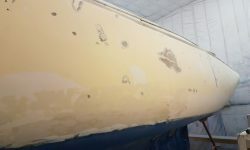 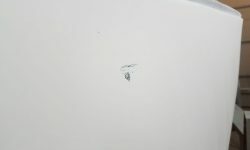 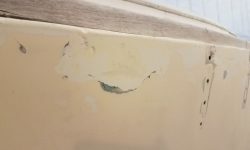 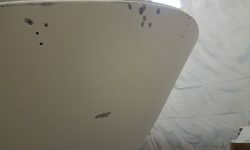 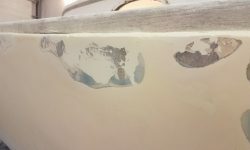 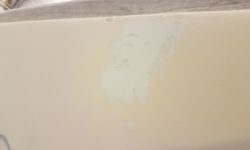 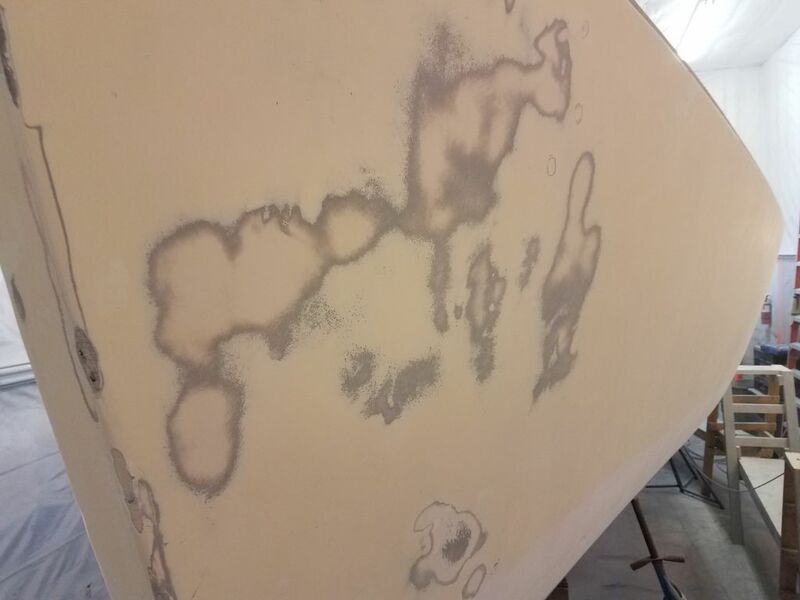 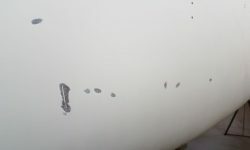 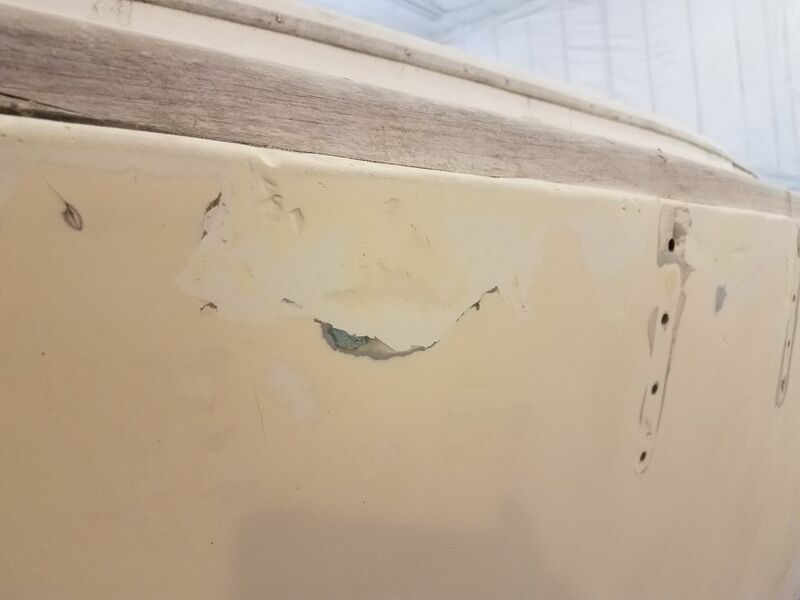 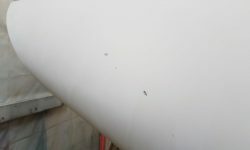 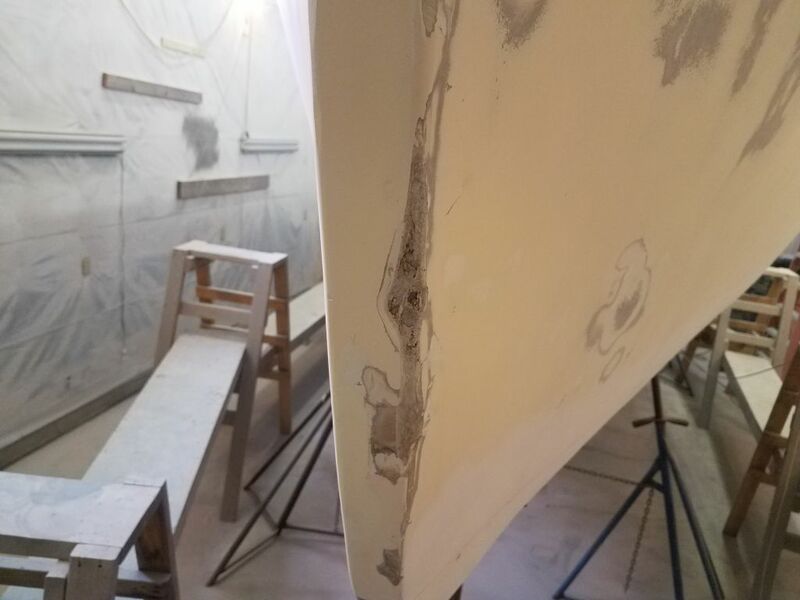 This was the first real indication I’d had that there might be paint on the hull, as the overall color and appearance had been close to that of the starboard side, other than the obvious damage on the port. 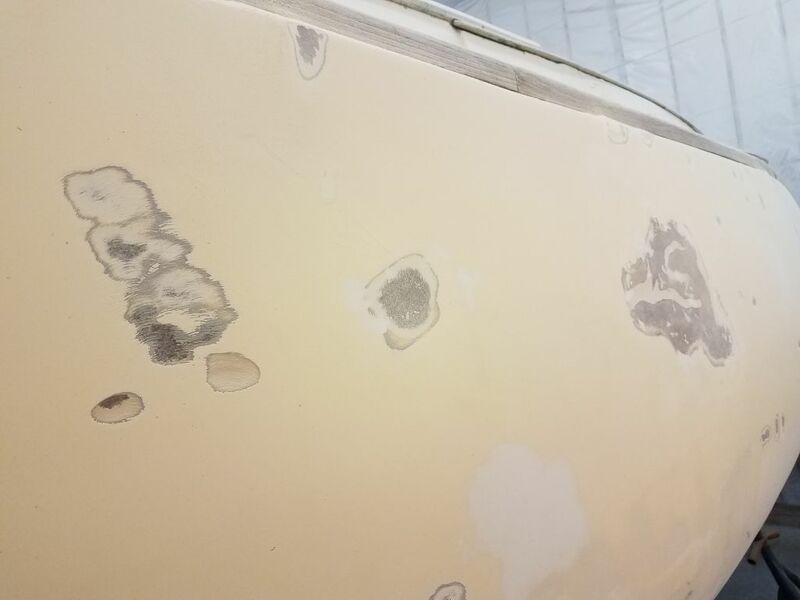 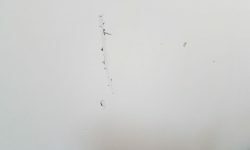 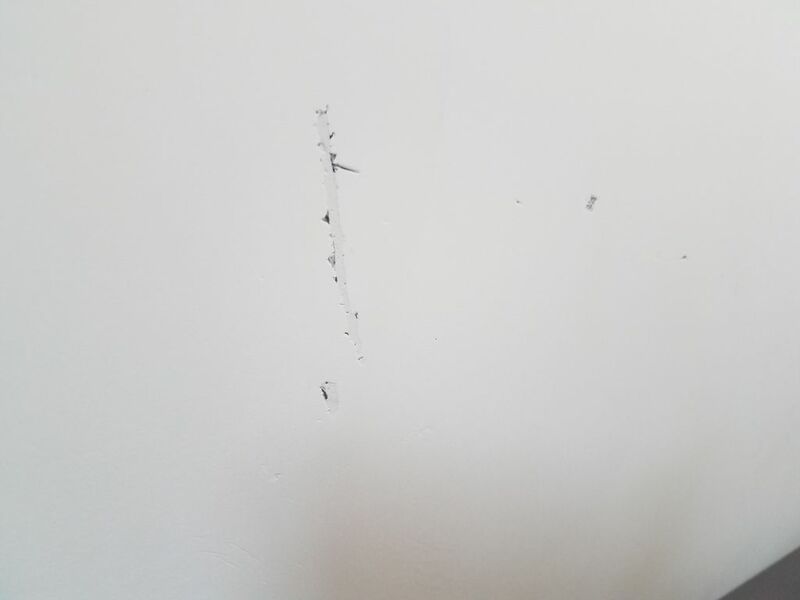 I hoped not to have to remove all the paint, but for now I reserved judgement pending further inspection and additional work. 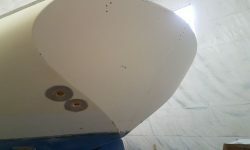 Only the bow showed signs of any adhesion failure. 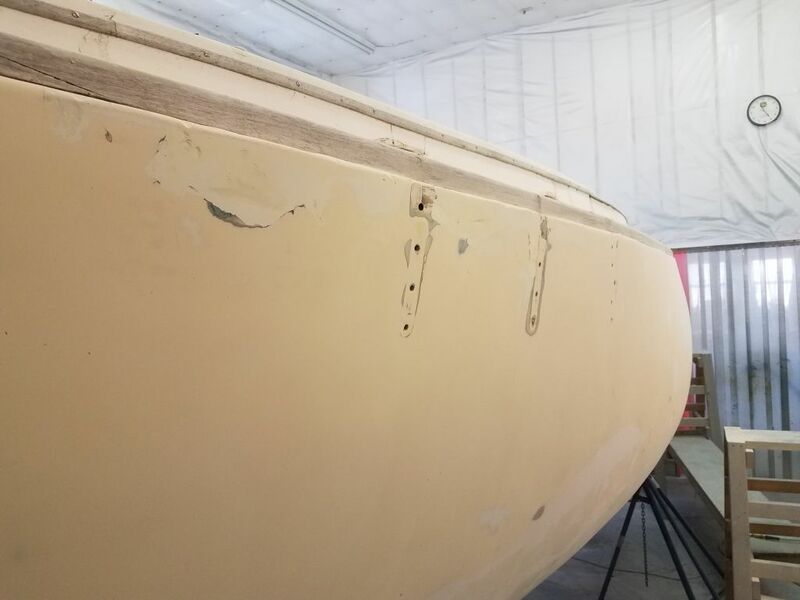 The hull looked a mess when I was done, but it also looked like progress, a better situation than the sorry appearance of the multiple patches and colors before. 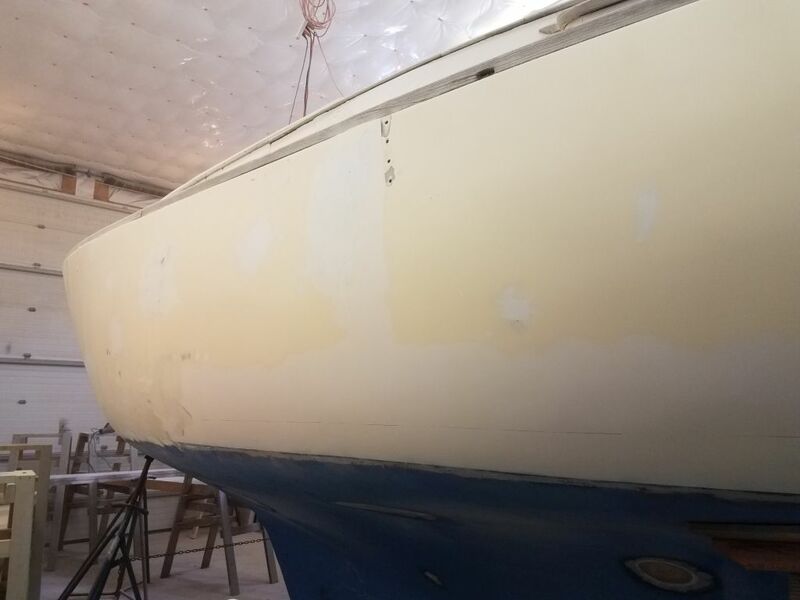 The main focus of the work ahead would be on deck, and I wanted to keep moving on the major demolition, sanding, grinding, and repair work, so with the hull prepared for its relatively minor level of work, I went ahead and reset the staging to deck height, where I planned to spend the next several weeks on the numerous repairs and substantial surface prep required. 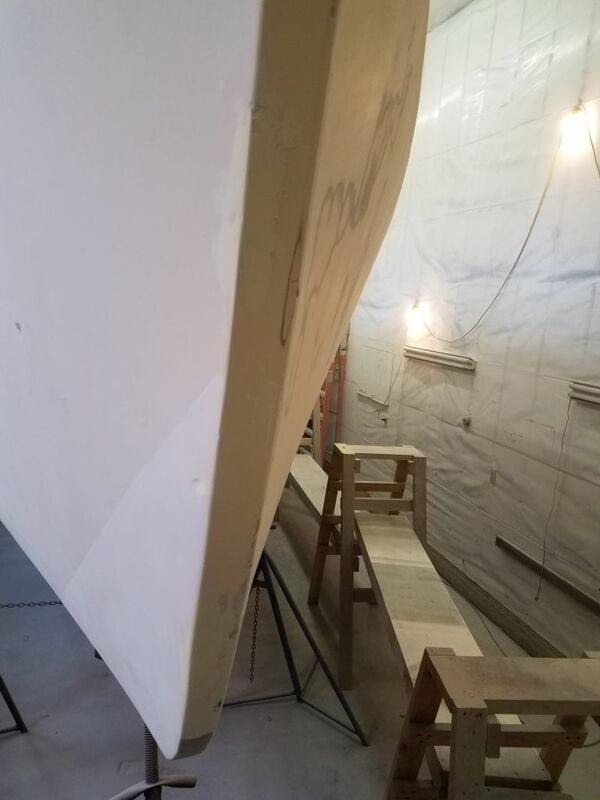 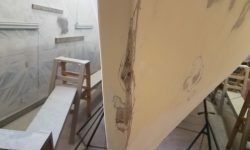 I had to add a second layer of staging at the forward end to allow comfortable working height at the bow, wits its substantial sheerline.